One of the five British hostages held captive by militants in Iraq has killed himself, a video obtained by the Sunday Times has claimed. The tape, purporting to come from the group holding the men, alleges that a man known as Jason died on 25 May 2008. British officials say they are not able to corroborate the claim. Armed militants, disguised as police officers, kidnapped the four bodyguards and a computer expert at the Finance Ministry in Baghdad in May 2007. The bodyguards worked for security company Gardaworld and the fifth man worked for American management consultancy Bearingpoint. 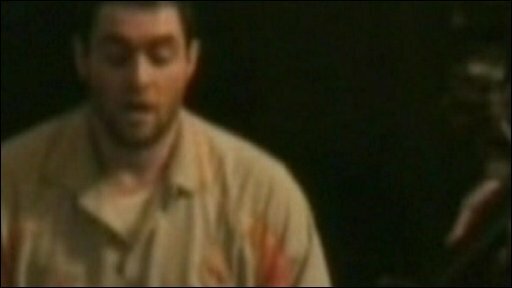 In the video, Arabic writing is shown as well as images of two other hostages. The group which is holding them calls itself the Islamic Shia Resistance in Iraq. In December, the kidnappers released a videotape of their hostages. It is understood that the man alleged to have committed suicide is the same Jason who appeared in this previous video. His family are said to have been informed last week. A statement, claiming to come from the captors, accuses the British Government of failing to respond to their messages. "This procrastination and foot-dragging and lack of seriousness on the part of the British government has prolonged their psychological deterioration, pushing one of them, Jason, to commit suicide on 25/5/2008," the statement ran. "He surprised our brethren, who were taking care of him, with his suicide." 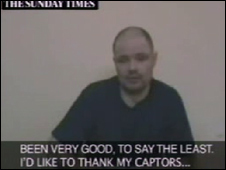 The video also shows another British hostage, Alan, who comes from Dumbarton, appealing to the British government to meet his captors' demands for the release of prisoners. "Physically, I'm not doing well," he says. "Psychologically, I'm doing a lot worse. "I want to see my family again." However, he makes no reference to Jason's alleged suicide. According to the Sunday Times, an intermediary who handed the video to its representative said Jason had attempted suicide on two previous occasions. Proof of his death would be handed over if the British government agreed to negotiate with the militants, the intermediary added. The men were snatched in broad daylight by around 40 men dressed as Iraqi police officers. In the previous film, dated 18 November, the militants said they would kill one of the men as a "first warning" unless the UK forces left Iraq within 10 days. The tape, filmed in front of an "Islamic Shia Resistance in Iraq" flag, shows one man giving his name, saying he has been held for 173 days and adding: "I feel we have been forgotten." Foreign Secretary David Miliband responded to the latest tape by condemning kidnapping as "disgusting". It "will cause deep distress and concern to the families of the five men", he added. However, he said the government remained open to working with anyone who can help free the men. Prime Minister Gordon Brown said he had raised the case of the five men with his Iraqi counterpart, Nouri Maliki, during his visit to Baghdad. He said he had also raised the issue with "Americans and others who are active in Iraq". In a statement, the prime minister said: "This abhorrent film will only add to the anguish of families who have suffered a great deal over a year for their loved ones who have been kept in captivity. "I call on the hostage takers to release these people who have been held in captivity immediately." The hostages' friends and relatives marked the first anniversary of their capture in May by appealing for the hostages to be released. The Foreign and Commonwealth Office has always maintained that sensitive negotiations for the men's release are going on behind the scenes. One of the hostages has been identified as Peter Moore, originally from Lincoln, who was working as a computer consultant. The identities of the four other men have not been confirmed. BBC security correspondent Frank Gardner warned that there were numerous reports that his colleague Alan Johnston was killed after he was kidnapped in Gaza - all of which turned out to be inaccurate. He added that the Iraqi captors appeared to want to do a prisoner exchange deal with the British government, and were not thought to be "bloodthirsty" in the same manner as al-Qaeda.